More info:Plus local payment from USD 980 to USD 1000. This amazing overland truck tour takes travellers on a real adventure across three of the Silk Road’s lesser-known stopovers: Kyrgyzstan, Uzbekistan and Turkmenistan to invite an unforgettable experience full of fascinating folk tales and uniquely eastern encounters. Starting from the Central Asian city of Bishkek, in Kyrgyzstan, this 30 day tour progresses into Ala Archa and Chong Kemin national parks for guided trekking and wild camping before continuing to Karakol, close to Issyk-Kul Lake, for a well-deserved night in a hotel. Uzbekistan is beckoning and you’ll cross the border from Dustlik to Andijon before journeying westwards for three nights in Samarkand via a night in the Uzbek capital city of Tashkent. Throughout this 30 day Silk Road tour you’ll witness some extraordinary sights, way off the typical tourist radar, with yurt camps in the Kyzylkhum Desert and the ancient Uzbekistan cities of Khiva and Bukhara, providing just some of the authentic cultural encounters. As you exit Uzbekistan at Nijazov and enter Turkmenistan at Shovot you’ll still have four exciting nights left with wild desert camping, close to the Darvaza Crater, and a couple of nights in the Turkmenistan capital of Ashgabat, providing a captivating conclusion to an epic overland tour. 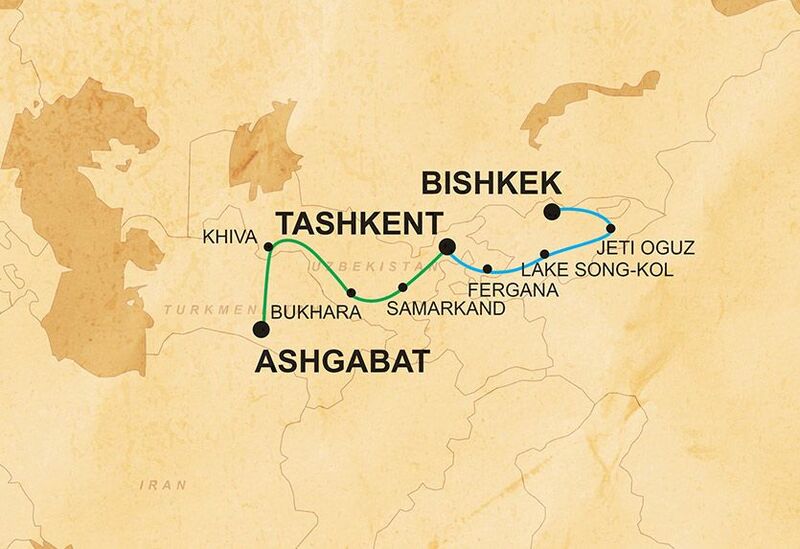 On this epic trip through Turkmenistan, Uzbekistan, and Kyrgyzstan, we will be travelling overland using our specialist overland vehicle, thus cutting out the need for air travel and reducing carbon-emissions. Going overland (by car and on foot for excursions) means you get to experience physically crossing the borders between countries as well as explore places which are off the beaten track. Wherever we are in the world, we prefer to use smaller locally-owned businesses, ensuring that local communities gain a direct economic benefit from our business, for example, we use small locally owned hotels, campsites and activity providers wherever possible. In the Kyzylkhum Desert and at Song Kul Lake we stay in locally-owned yurts, and in Arslanbob and Kochkor we stay in homestays within the community, which provide local rural people with tourist revenue and employment, as well as providing a superb opportunity for local interaction. We use local guides and operators throughout the trip; for example, in Turkmenistan, Uzbekistan, and Kyrgyzstan we use responsible local operators that provide training and employment to many local people as guides, providing them with stable employment in the tourism industry.